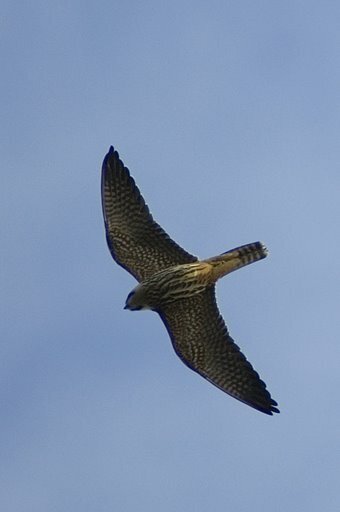 Today we managed to get our own photos of the hobby. 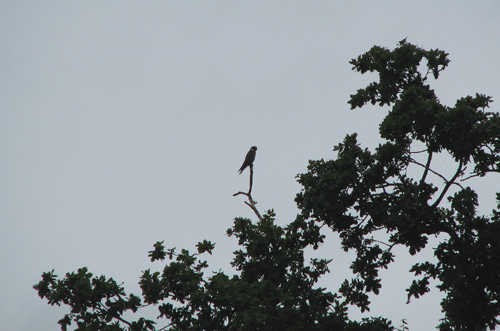 Here it’s perched on a dead branch at the edge of Ravens’ Copse. I was going to expand the photo so you could see the barring and colour, but it looked so atmospheric, I’ve left it. Robert also saw a very large butterfly flying high in the copse. By its size he thought it could just possibly be the rare, beautifuland elusive Purple Emperor. Maybe, just maybe, he’ll be able to confirm this. And yes, the hobby is using the raven’s nest. 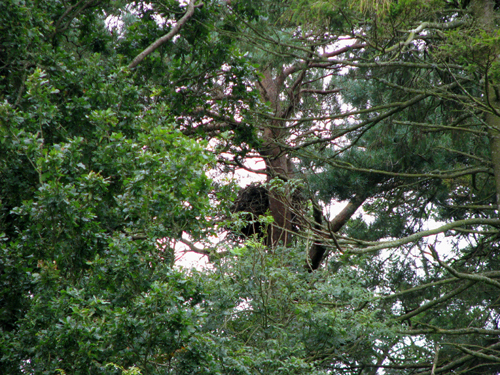 If you look ito the centre of the photo you can see the enormous jumbled mess of twigs and branches – that’s the nest. We have a new visitor to the farm. About a month ago I became aware of a different sound in the air. Not listening properly, at first I thought it was the ‘yaffle’ of a green woodpecker, not a common bird around these parts; we’re more likely to be home to the great spotted woodpecker and occasionally, very occasionally the rare lesser spotted woodpecker. So, when I heard the call, I thought ‘oh, that’s nice’ and got on with whatever it was I was doing. But it was persistent, and, when I came to listen properly, quite different – ‘klee…kleekleekleekleeee’ – it called. 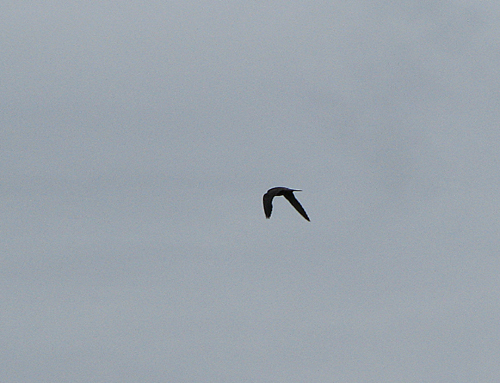 During the summer we occasionally get a hobby flying high, high over the farm chasing swallows or martins to feed its fast growing young. But we’d never had one persistently around. Ravens’ copse is a small area of woodland butting onto sections of Dillings, Rushy and Five Acres. It has tall mature Scots pines and, as the name suggests, has been the home to nesting ravens since time immemorial. I decided to do a bit of research, and yes, hobbys do like to nest in old crows nests, often in fir trees, and yes, the young are frequently lost to crows nesting in the area. So ravens? Umm, I think I’ll keep my fingers very crossed there. They, the hobbys, are most active first thing in the mornings when I’m checking the stock and it’s wonderful to see them sweeping out over Marymead looking for food for their ravenous young. The other morning I witnessed a full-on dog fight between hobby and raven high in the tops of the scots pine across from Dillings. 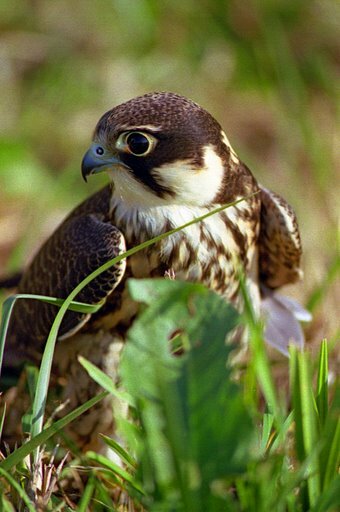 The aerobatics, speed and dexterity of the hobby’s movement and flight was extraordinary and exhilarating to watch. They won that time as the next morning the now familiar ‘klee…kleekleekleekleekleee’ rang out over the farm as they went in search of breakfast.